Sport‘s ‘Confidencial’ section on Tuesday has some transfer claims which they’re insisting have been backed up by sources at Barcelona. 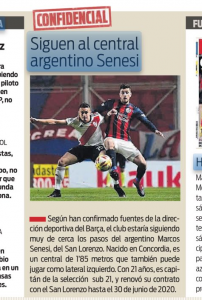 The Catalan newspaper state that ‘according to sources confirmed by the sports management of Barca’, the club are interested in signing Marcos Senesi. The 21 year old is an Argentine defender currently playing for San Larenzo, a club where he came through the ranks. Left footed, Senesi is primarily a central defender, but he can also play as a left back if called upon. Barcelona are said to be ‘following closely’ the development of the youngster, as they look at a new wave of potential South American recruits. In recent months it’s been reported repeatedly in the Catalan media that the club are sending officials to South America to not only spot the best talent coming through, but also to get Barcelona in a position to be able to do advantageous deals in the future. A lot of it will be getting ahead of Real Madrid and their efforts to do the same.